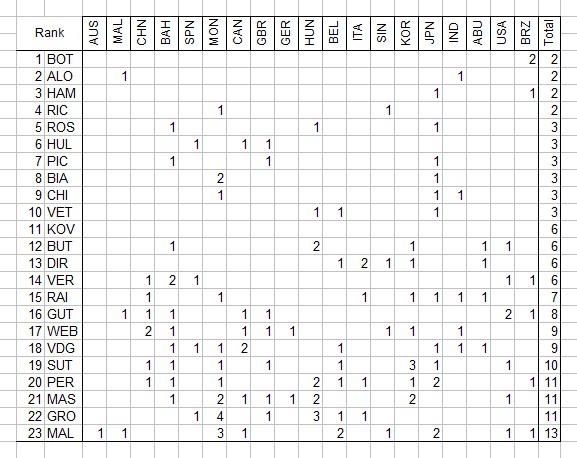 In order to produce my drivers' rankings (that combine ratings from across the board) it was necessary to analyse a lot of data, and rather than hiding behind my final rankings, this is going to be an explanation of where they came from and what the raw results are (before the rankings were generated). Some categories are relatively simple, whereas others are far less transparent, and I hope to be able to demonstrate where everything came from. 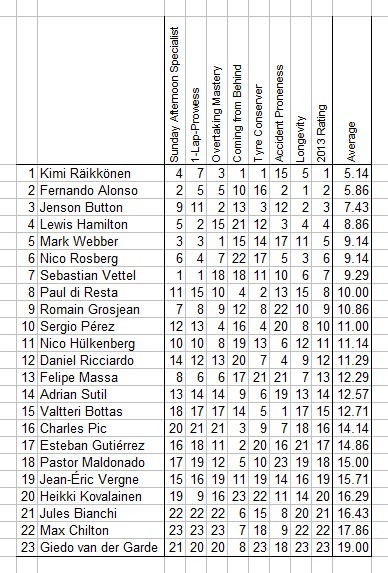 A score for each category is generated then this is ranked from 1-22, the average of these rankings is used to generate the 2013 average, and thus the final 2013 driver ranking. Accident proneness: The number of crash-incidents a driver has been involved in (regardless of fault) - low scores are good, high scores are Grosjean. 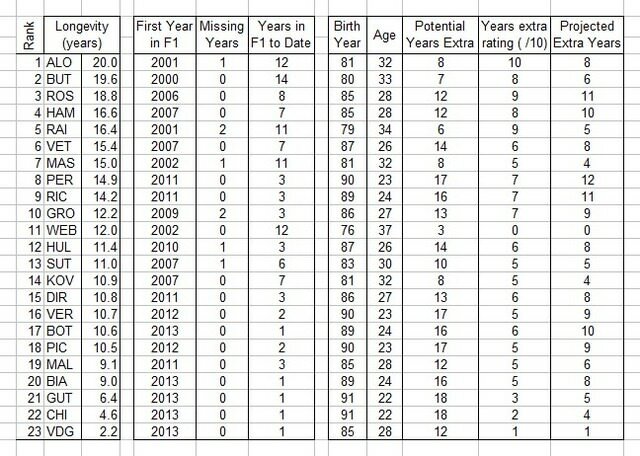 Interestingly, the final longevity rating and my years extra are very strongly correlated, with Mark Webber as the only outlier – mainly because he is definitely not driving in F1 next season. Tyre conserver: For each race the average number of tyre stints (of classified finishers) is calculated, then this is subtracted from an individual drivers’ number of stints to produce the fraction of sets of tyres above or below average they used in that race. These are then averaged to produce an average across the full season. Races where a driver does not finish are discarded as this would unfairly benefit that driver, given that they’d most likely use fewer tyres than average. This is the reason why we cannot just count the number of sets of tyres used over the course of the 21 races. Overtaking mastery: This is the complicated one. It starts with lap data (lap-time and position) that I have downloaded from an online F1 database. 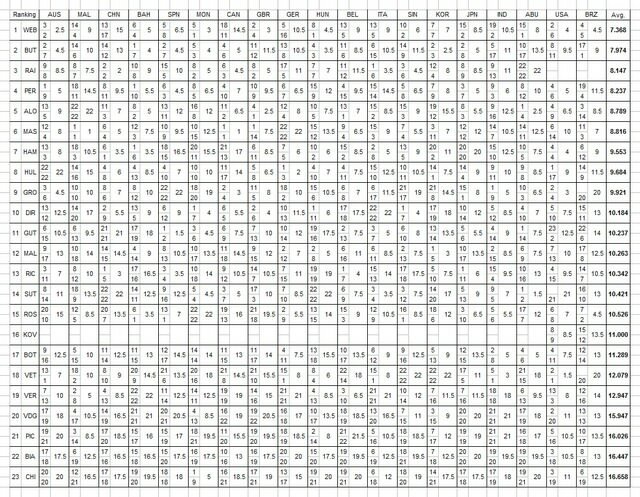 For each race I then isolated the position on each lap for each driver and compiled a table of positions against laps. 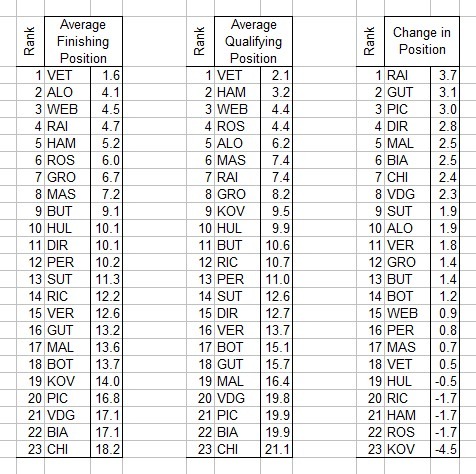 I ranked these positions, incorporated a correction to eliminate ‘overtakes’ caused by pit-stops or retirements, and then calculated the differences between the lap to lap positions. When I summed the negatives (i.e. 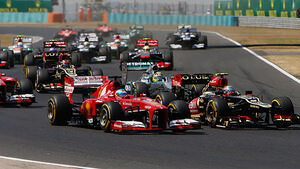 the overtakes) this generated a total number of positions gained in the race. However that is not the end of it, as being in the middle or towards the back of the pack lends itself to more overtaking opportunities. So I normalised the totals against starting position (as a fraction of 22). This means that the more infrequent overtakes by drivers at the front end of the race count for more than the more plentiful place-swapping that happens between the backmarkers. 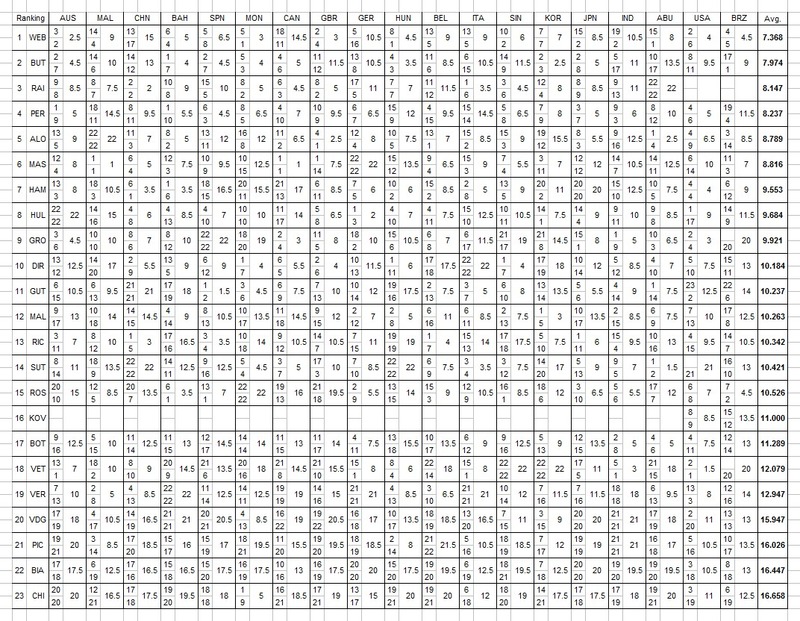 I ranked this new rating and the total number of positions gained separately, then took an average of them to produce a final, which itself was ranked for each race. The overall (and final) number is then a ranking of the average of each race’s score. All in all what some might call a meta-ranking! 2013 rating: The ranking of the average of the previous seven ratings.